Small workgroups will find the Brother MFC-8510DN an ideal solution for printing, scanning, copying, and faxing needs. The MFC-8510DN multifunction monochrome laser printer has a monthly duty cycle of 50,000 pages and can deliver a maximum resolution of 1,200 x 1,200 dpi. It has a super G3 fax with 33.6 kbps modem, and PC fax is offered. The Brother MFC-8510DN does not have Wi-Fi. This compact unit comes in black and has a flatbed scanner with ADF along with a control panel with LCD display, numeric keypad, and function buttons. The paper cassettes can handle 250 sheets at a time. For connectivity, USB and Ethernet ports are provided. The Brother MFC8510DN high speed office mono multifunction printer works efficiently at speeds of up to 38 ppm. The handy Brother MFC-8510DN printer has a small footprint yet delivers high-quality output at quick speeds. The Brother MFC 8510DN laser printer can work even without a PC, as users can directly print from or scan to their thumb drives with the front panel USB port. Workgroups can easily share the Brother MFC-8510DN, thanks to the built-in Ethernet plus they can also access AirPrint and Google Cloud Print. This unit comes with an ADF and automatic duplexer. One of the main troubles with the Brother MFC-8510DN multifunction printer is its limited paper handling capacity. 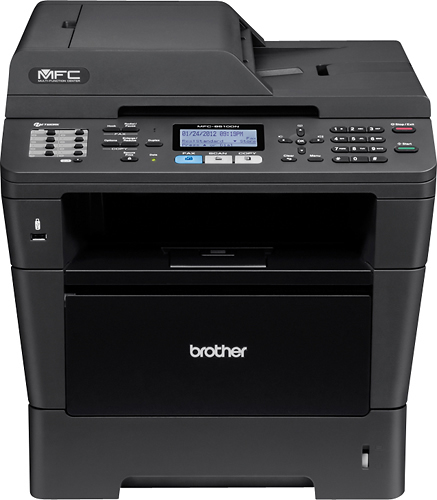 The Brother MFC8510DN all-in-one printer can only hold 250 sheets and optional trays are not offered. Wi-Fi connectivity is not available.